On Saturday evening, the City of Orlando hosted its 8th Annual Blues B-Q at the corner of Garland and Central in downtown Orlando. Musical acts The Lee Boys, Denise LaSalle, and Southside Johnny and the Asbury Jukes brought the blues, while food vendors Bubbalou's BBQ, Caribbean Sunshine Bakery, Serena's BBQ, Cave Inn BBQ, and Smokey Jay's BBQ brought the delicious and savory fare. 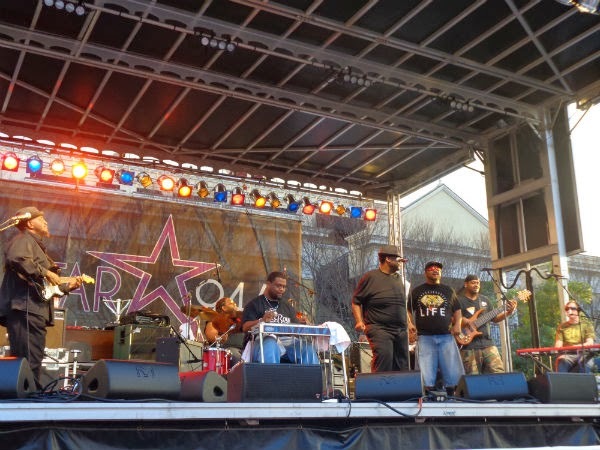 The Lee Boys, funk and Gospel out of Miami, took the stage around 6 p.m., and brought the crowd to life with their sacred steel stylings, driven by blues-based beats and led by Roosevelt Collier on the pedal steel guitar. Performances of "So Much to Live For" and "I'll Take You There" got the energy moving as the sun set over those who'd gathered to eat, drink, and dance their blues away. And then came a Lee Boys rendition of "When the Saints Go Marching In" that had some shaking in the Spirit like it was Sunday morning (watch the video below). The sacred steel tradition was developed around the 1930's in the worship services of a set of Pentecostal, House of God churches. Its most well known performers include The Campbell Brothers, Aubrey Ghent, and Robert Randolph and the Family Band. The Lee Boys have played over 100 sets at major music festivals including the New Orleans Jazz and Heritage Festival, Bonnaroo, Wakarusa, Wanee, and All Good Festival. Other sponsors of Saturday's event included STAR 94.5, Budweiser, MetroPCS, Downtown Orlando, Bright House Networks, and Lakeridge Winery and Vineyards.